If you are overweight or suffer from obesity then these 3 kettlebell and body weight workouts are for you. Most general workouts are inappropriate for obese or overweight people and can include exercises that will cause joint issues or prove to be very demotivational. The great news is that the more overweight you are the quicker you will tend to lose fat when you first start exercising. The following 3 fat loss workouts progress gradually and are short and manageable. When you are obese and first start lifting weights you need to keep things simple but at the same time activate as many muscles as possible with simple movements. This first workout will exercise your entire body with only two exercises. You will also find that the deadlift exercise increases your cardio quickly without the need to even move your feet. Perform each exercise one after the other taking as little rest as possible. As the deadlift is our strongest movement pattern you should be able to lift heavier weights that you imagine. So master the exercise first and then challenge yourself with a heavier kettlebell. Men should start with a 12kg (26lbs) or 16kg (35lbs) and women a 8kg (17lbs) or 12kg. 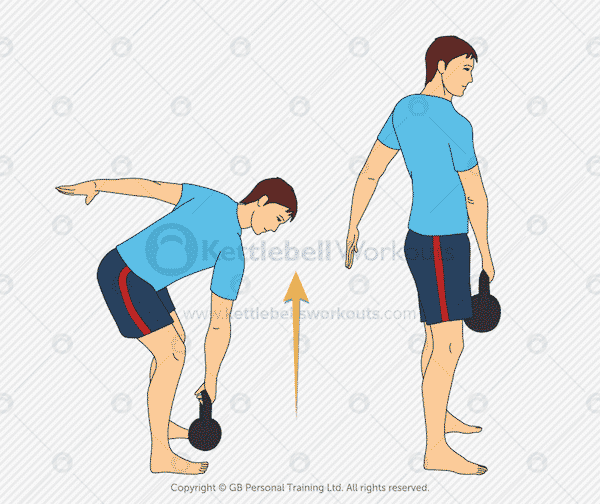 The kettlebell single arm deadlift exercise is a good full body movement for obese people to start using. 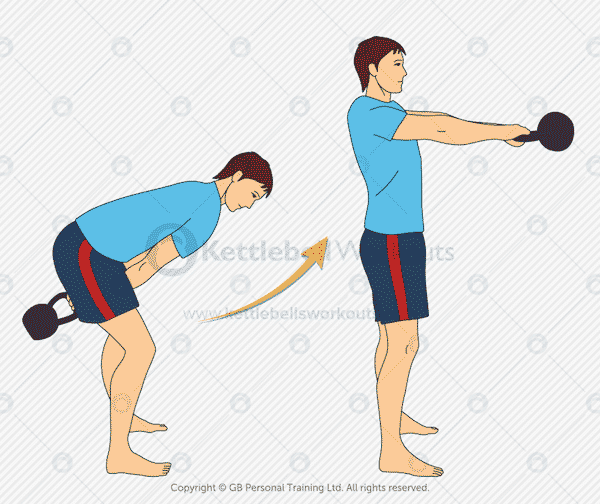 This kettlebell exercise is low impact and works into the legs, hips, buttocks and back muscles. You will also find that the deadlift, if performed with the correct weight and number of repetitions, is very cardiovascular. The movement requires a good hinging at the hips with a flat back and a straight arm. Keep your shoulders down as you lift and away from your ears. The kettlebell works well for this exercise because the handle sits up nice and high for you to grab from the floor. The bodyweight wall slides exercise will strengthen the shoulders and upper back muscles. Although this exercise may look easy at first glance it is actually very challenging when performed correctly. Stand with your buttocks, upper back and head against a wall. Raise your arms and push your elbows and wrists into the wall. With constant pressure against the wall raise your arms up as high as possible without them coming off the wall. Once your arms start to lift off the wall slowly lower them back down again. This exercise should be performed slowly with control and constant attention to maintaining contact with the wall. This workout for overweight people progresses on from the beginners workout by adding slightly more challenging exercises and three rather than two exercises. Both the kettlebell clean and bird dog are technical exercises so it is important that you take your time and get the movements right. Work through each exercise one after the other, at your own pace, taking short rest periods if necessary. Don’t rush through the exercises, make sure you perform them correctly. The kettlebell clean exercise injects a little more fun into your workouts but it can take a little while to master. Just like the deadlift exercise the clean uses the buttocks, legs and hips to lift the kettlebell. 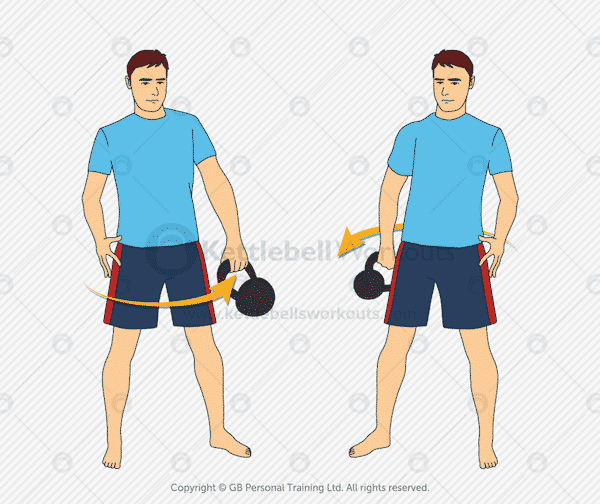 The snap of the hips forwards and the squeezing of the buttocks is what pops up the kettlebell allowing you to wrap your arm around the kettlebell. If you find you start banging your wrists with the kettlebell then you will need to focus more on keeping the kettlebell closer to the body rather than looping it up and over. 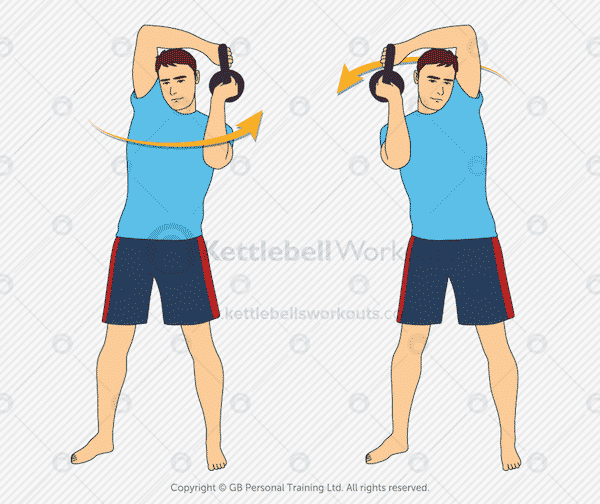 The kettlebell slingshot is an excellent exercise for working the shoulders, arms, forearms and core muscles. Stand upright with your arms straight and keep your hips as still as possible as you pass the kettlebell around your body. Be sure to keep a little space around you just in case you drop the kettlebell. 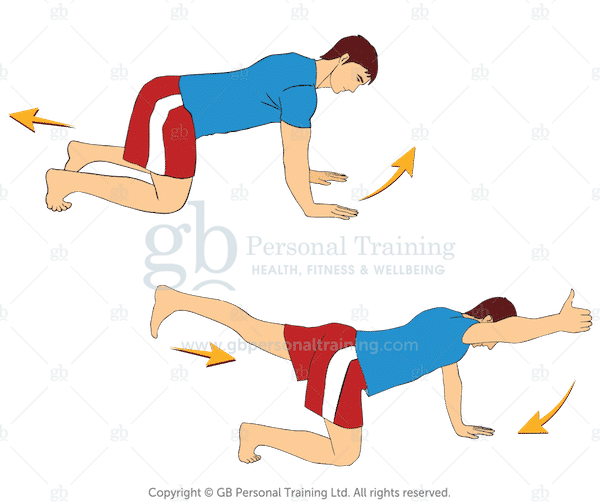 The bodyweight bird dog exercise will strengthen the core muscles, shoulders, buttocks, arms and hips. From an all fours position with the hands underneath the shoulders and knees under the hips extend the opposite arm and leg. The leg should be extended directly backwards activating the buttocks but care should be taken not to raise the leg too high and thus arch the lower back. The arm is extended out at 45 degrees with the thumb upwards activating the upper back muscles. You will find the arm on the floor supporting the movement will get tired quickly so be prepared and rest for a few seconds if necessary. This final workout advances the movements you mastered in workouts 1 and 2. Both the kettlebell swing and bodyweight squat are huge full body exercises that will rapidly increase your heart rate and strengthen your body. As with the previous two workouts each exercise is performed one after the other with little or no rest in between them. The kettlebell swing is the ultimate full body fat burning exercise. Each dynamic kettlebell swing will condition the legs, hips, buttocks, back and core muscles. Plus, swings increase your heart rate very quickly without the need to even move your feet. Just as with the kettlebell clean and kettlebell deadlift the swing requires a good hinging at the hips and a flat back throughout. The wrists should make contact with the inner thighs and no deeper. 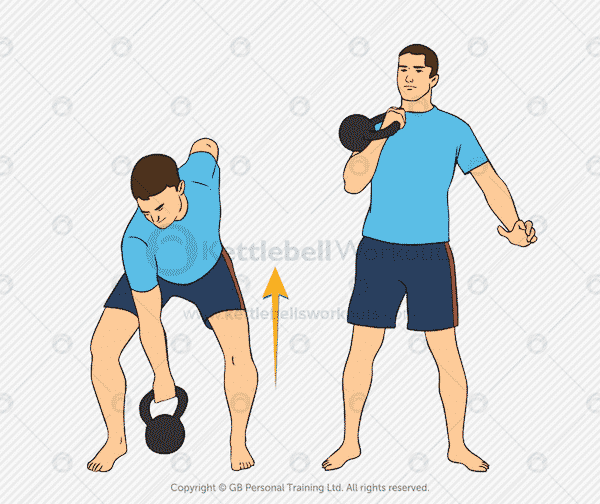 The kettlebell should be swung to chest height and no higher. The kettlebell halo will work into the upper back, shoulders, arms and forearms while at the same time improving your upper back mobility. Stand upright with your chest up and neck straight, do not look down. Holding the kettlebell in both hands take the weight around your neckline. Keep your elbows in nice and tight as you take the kettlebell around in a smooth controlled motion. The bodyweight squat is a very important exercise and should be mastered by all. Not only does the squat work most of the muscles in your body along with your cardio but it is also a very important exercise for pumping nutrients around the body. Even though obese people can struggle with the squat it is vital that they are aware and work through the movement. The bodyweight squat can be made easier by sitting down onto a bench or chair and standing back up, or holding onto a pole, or door frame. The goal is to squat down to parallel with the floor with your thighs in order to fully activate the buttocks. 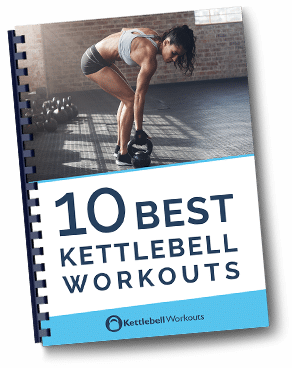 There are 3 workouts listed above each using both kettlebells and body weight. Each workout builds on the one before so you should master each workout before moving on to the next. Start with 3 workouts per week, taking 1 days rest after each workout. Continue like this adding in workout 3 in week 6. Push yourself by increasing the number of repetitions for each exercise or by increasing the kettlebell weight. You are in full control so if you feel that things are getting a bit too much then you can always repeat a number of weeks without progressing to the next workout. 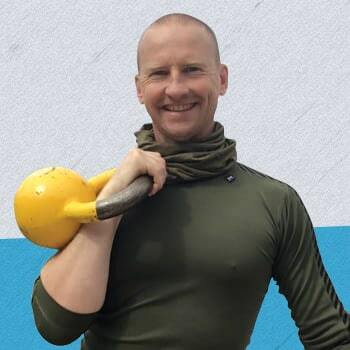 Above I have listed 3 kettlebell and bodyweight workouts that can be used by overweight and obese people. The workouts are short and manageable so they should be easy to fit into your current lifestyle. I’ve also included an example of a fat loss program for you to follow. The most important thing with any workout program is to just start. Do what you can each workout and start to build up a workout habit. Mix the above workouts with a good all natural nutrition plan and you’ll be seeing results in no time.